Everton will play their FA Women's Cup semi-final against Notts County at Goodison Park, despite it being the home of their men's team. 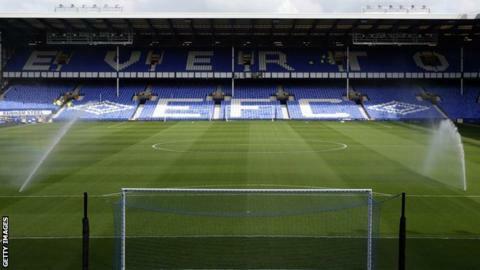 Goodison has been chosen as a neutral venue for the game, which will take place on 3 May. Chelsea, who knocked out holders Arsenal in the quarter-finals, take on WSL 1 rivals Manchester City at Wycombe's Adams Park on Monday 4 May. The final on 1 August will be held at Wembley for the first time. Everton, who play their home games at Widnes, just half an hour from Goodison Park, are the only former winners left in this year's competition. Notts County have stressed they are in favour of the tie being played at the 40,000-seat stadium. "It's always been a dream of ours to play at Goodison Park, but none of the current team have had a chance to play competitively there," said Everton captain Michelle Hinnigan. "We hope the occasion will bring us lots of support and allow us to show the Blues' fans how much the quality of women's football has improved." Woking's Kingfield Stadium and Alfreton's Impact Arena hosted last year's semi-finals, with attendances of 877 and 638 respectively.